Make 2019 Your Year To Sing! If you have you always dreamed of singing in an accomplished vocal group, and would like to learn about vocal techniques and a cappella singing, we’d love to see you at our 2019 Vocal Education Program! 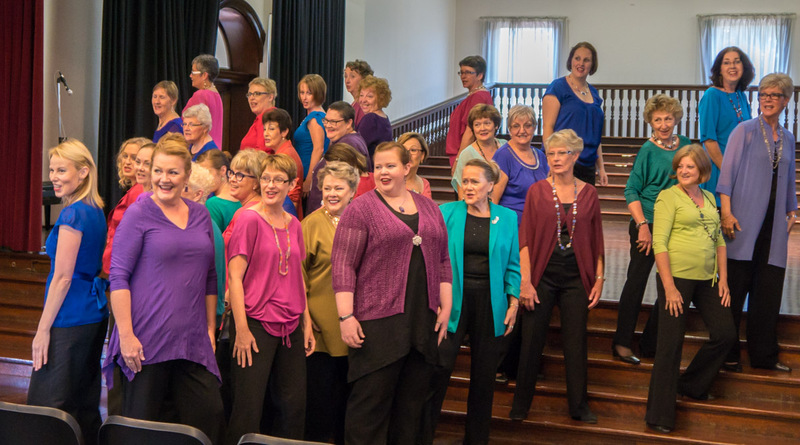 Our chorus includes women’s voices of all ranges – from high to very low. If you feel your voice is too low for the standard soprano and alto range, we particularly want to hear from you! Our four-week vocal education program will run from 14 February to 7 March 2019, each Thursday from 7pm to 8:30pm. You’ll learn to sing in four-part harmony, and discover how to improve your own singing technique. At the conclusion of the program, you will have the opportunity to perform with us to celebrate International Women’s Day on the evening of Friday 8 March. Registration is $100, which includes learning materials and group vocal tuition. For more information, contact Kim via info@brisbanecitysounds.com.au or 0433 152 247. A festive crowd gathered in Sacred Heart Church at Paddington for BCS’s fourth annual Christmas concert on Friday 30 November. The beautiful church was the perfect setting for the soaring harmonies of the chorus and quartets Sparkling Blends, Kit ‘n’ Kaboodle and Mockingbird as they sang carols old and new. For the first time, we were joined by special guest choir Bardo Voce, from Bardon State School. The crowd snapped up baked goods and refreshments at interval, and donated generously to support BCS’s chosen charity, Share the Dignity's “It's In The Bag” campaign. With the donations received, we put together 37 bags of items for women and teenage girls in need. Our final performance for the year was at the St Gerard Majella Christmas Festival on Wednesday 19 December, amid their spectacular Christmas lights display. Children in the audience enjoyed singing along with a few of our songs, and even helped Kelly with the musical direction! BCS sends our best wishes to all our friends and supporters for a wonderful festive season and an exciting year in 2019! BCS Quartets Go To Town! 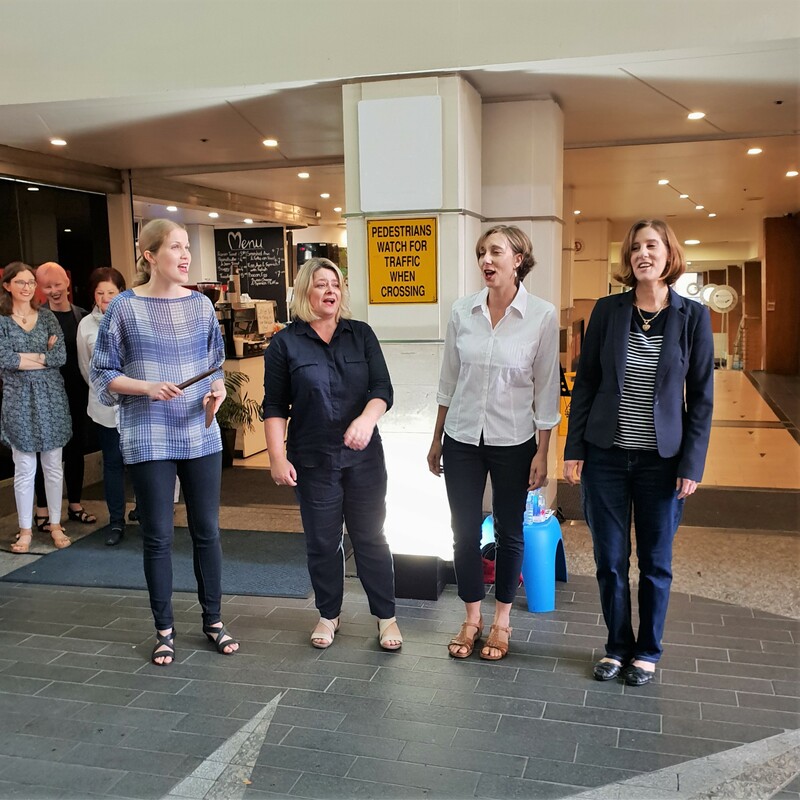 Quartets from Brisbane City Sounds performed in Burnett Lane as part of Brisbane Open House, a festival that offered behind-the-scenes access to buildings across the city on the weekend of 13–14 October. Those who braved the rain and ventured into the city were well entertained by three quartets from BCS – Sparkling Blends, Kit ’n’ Kaboodle and Mockingbird – singing both as quartets and octets. The weather may have been cold and wet, but the reception from the crowd was warm! Welcome Lisa, Diana and Deirdre! After completing a three-month onboarding program, three candidates were voted in as full members of BCS in July. 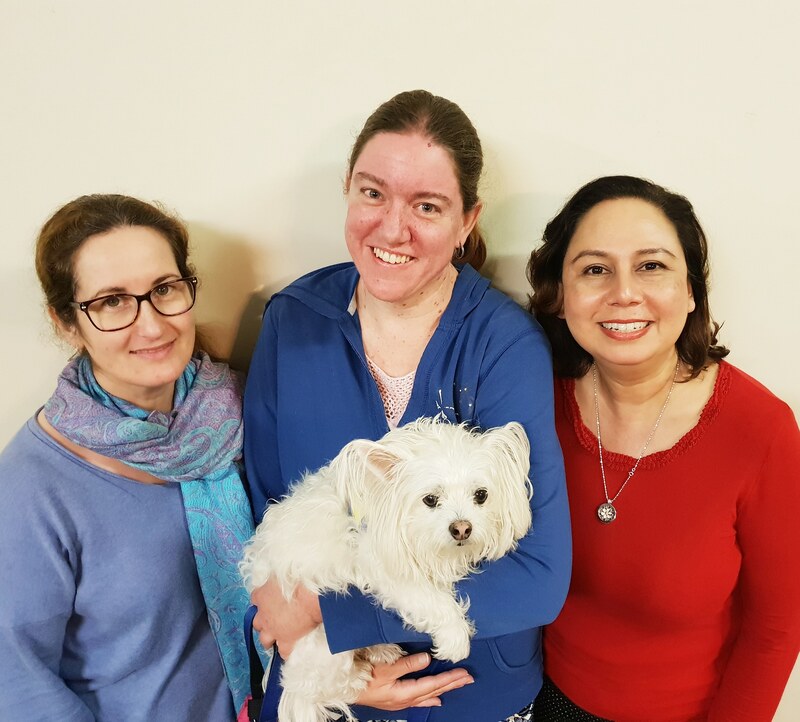 Diana,Deirdre and Lisa, who all sing lead, took part in our vocal education program in February. Following a successful audition, they commenced the onboarding program, which required them to learn three new songs and receive instruction on vocal technique and performance skills. Onboarding offers prospective members a chance to fully understand what membership of the chorus involves. The new members recently performed with the chorus at our Mamma Mia movie afternoon at Palace Barracks Cinemas. We look forward to many more performances with these talented women! 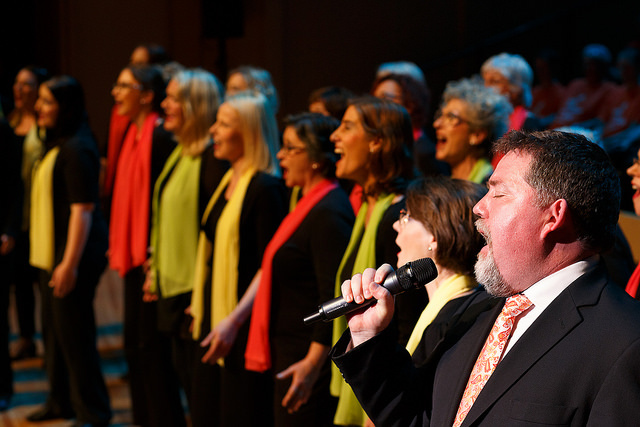 Rehearsals are in full swing for this year’s Brisbane Sings performance at Queensland Performing Arts Centre. The theme this year is Disney and music from the 80’s, which is fun to sing and will be entertaining for the audience. BCS members will join with a massed choir of 500 voices, and a small group from BCS will perform one of our favourite songs, “Throw Your Arms Around Me”. This joyful and colourful spectacle will be held on Sunday 12 August at 5pm, and will raise funds for charity partner Mummy’s Wish. Buy a ticket and come along – you will not be disappointed! 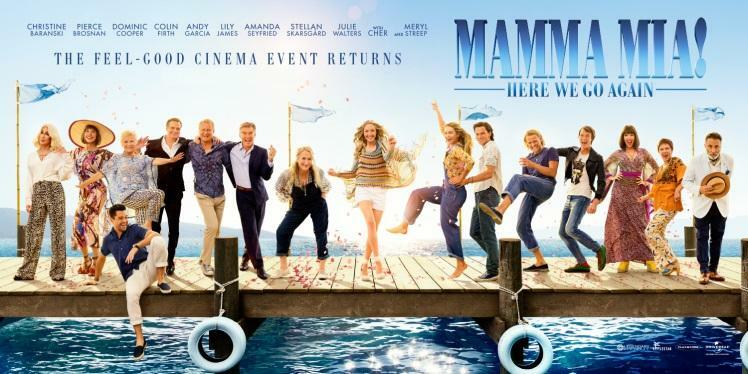 Get ready for a fun afternoon’s entertainment when Brisbane City Sounds hosts a screening of the much-anticipated sequel to the Mama Mia movie – Mama Mia! Here We Go Again. As usual, BCS will entertain you with a few songs and a glass of bubbly or orange juice before the screening at the Palace Barracks Cinemas on Sunday 22 July at 2.30pm. Some of our new onboarders will be joining us for their first performance, and our quartets, Sparkling Blends and Kit‘n’Kaboodle will also be singing. More information is available via our event page, and tickets are available now! 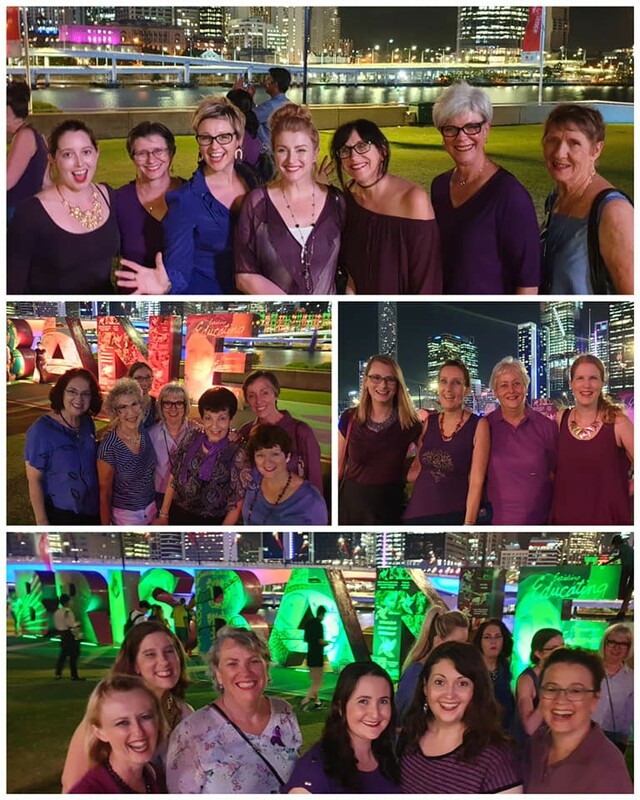 Brisbane City Sounds is proud to have successfully competed in the Sweet Adelines Australia Convention and Competition in Hobart on 19 May. In a field of 23 choruses, BCS placed 13th – improving our previous score by 18 points (from 518 to 536) and moving up a grade. Led for the first time by Musical Director Kelly Shepard, BCS presented Love Letters as the ballad, and Peter Allen's When I Get My Name in Lights as the uptune. The audience responded particularly well to our uptune, especially the staged lighting effect at the climax of the song. Hobart hosted a wonderful convention at the Wrest Point Casino, despite some areas of the complex being inoperative as a result of flooding the previous week. 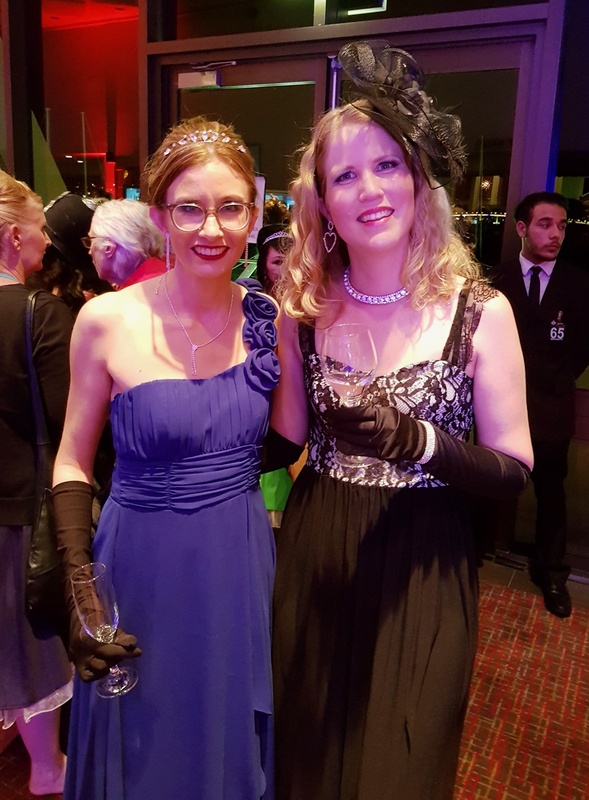 The afterglow on Saturday night after the chorus competition, themed for the royal wedding, was well attended by many wearing fabulous royal costumes and tiaras. Our chorus was fortunate to be chosen for coaching during the Sunday morning workshop, and gained some valuable pointers from the judges. Other highlights of the weekend included joining with 900+ voices in the mass sing, watching the quartet competition, and socialising with BCS members and members of choruses from all over Australia. 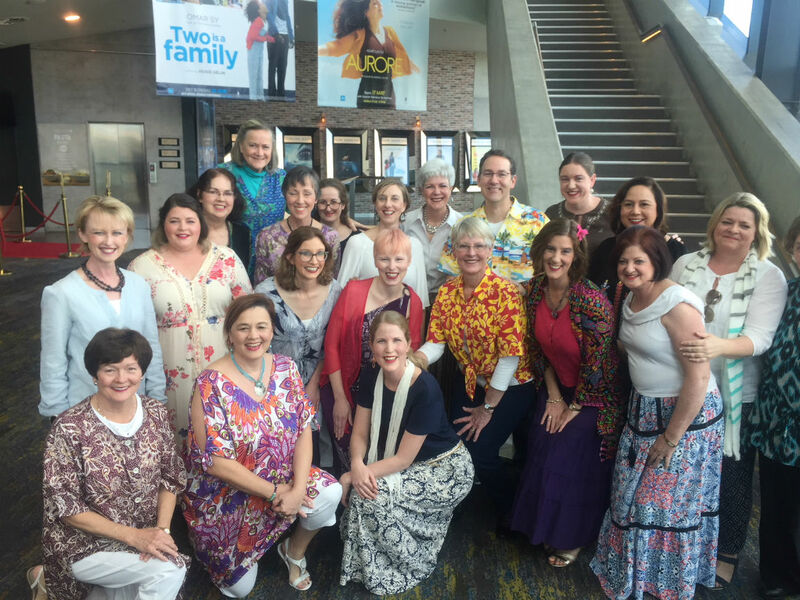 In addition to Kelly, five of our members – Olivia, Suzi, Anne, Edit and Courtney – experienced the weird and wonderful world of a Sweet Adelines convention for the first time! Let's hope they are hooked like the rest of us are! 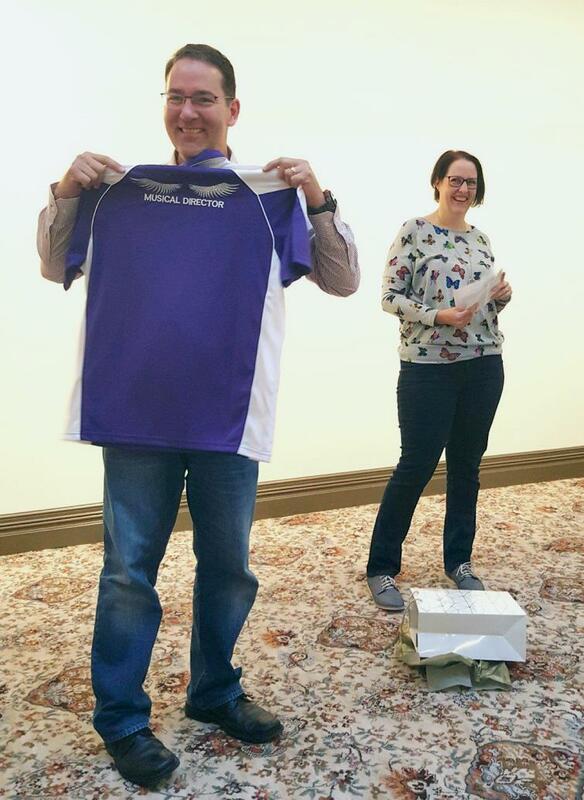 Thanks go to Kelly and our leadership team members, who worked extremely hard in the lead-up to convention. And well done to the BCS marketing team, which was presented with an ‘Outstanding’ in the Marketing Awards, for our Membership Drive and Community Outreach. Finally, a huge thanks to everyone who sent us well-wishes, cheered us on via the webcast, and helped us on our journey. We really appreciate all the support! Kelly with his new BCS shirt - also showing off his false eye lashes; Leela and Michelle at the royal wedding afterglow. 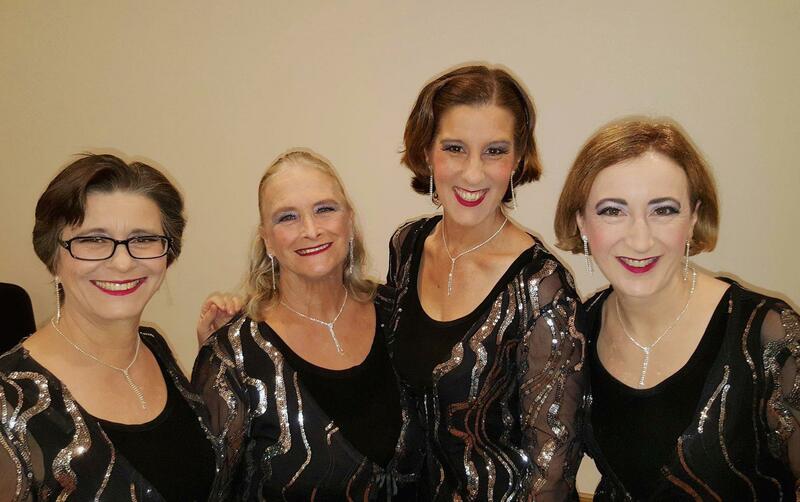 Feature image: Helen, Margery, Ainslie and Anne ready to hit the stage! Sing With Us - Audition Night! 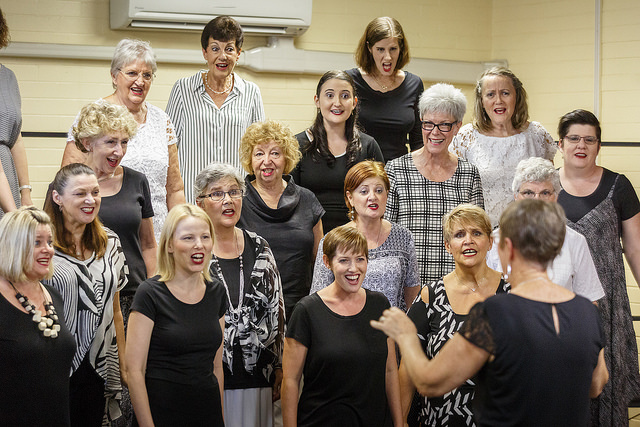 The next chance to sing with Brisbane City Sounds will be on Thursday 14 June from 7pm – spread the word to any women you know who love to sing! No preparation for the audition is required, and music theory knowledge is not essential. We invite interested singers to join us for our evening rehearsal, and meet with a BCS music team member to demonstrate their musical abilities in a non-threatening environment. Successful auditionees will join us for further rehearsals and enter our new-look onboarding program a little later in the year. Interested women can contact us if they need further information, or RSVP to our Facebook event to receive additional updates on the audition night. However, RSVPs are not required - you may simply show up on the night and have a go! 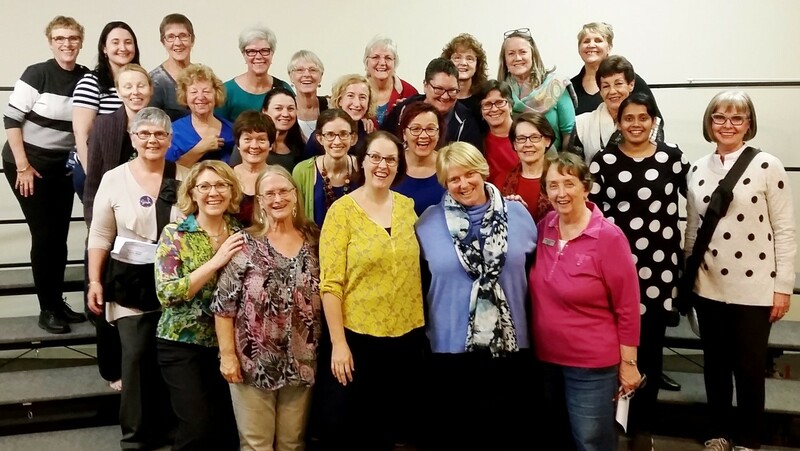 With the Sweet Adelines Australia Convention in Hobart drawing closer, BCS members came together for a weekend retreat on 21 and 22 April to focus our concentration on our contest songs. Not only did we make great progress on our performance set, but we also used this special time together to strengthen our bonds with each other by working, eating and playing together. Instead of holding our retreat away, as we have done in the past, we worked in our regular rehearsal space, and celebrated on Saturday night with a delicious dinner cooked for us on site. Delicious antipasto, pizzas and gelato, together with a few drinks and some giant games such as connect four and jenga, made for a celebratory evening. Our sessions on both days, led by Director Kelly Shepard and visual team members Liliana Macarone and Jess Harriden, provided plenty of variety and opportunities for improvement. During the retreat, the award of Sweet Adeline of the Year was presented to Jess Harriden, who has done an amazing job of preparing and coaching us in the visual aspects of our performances. 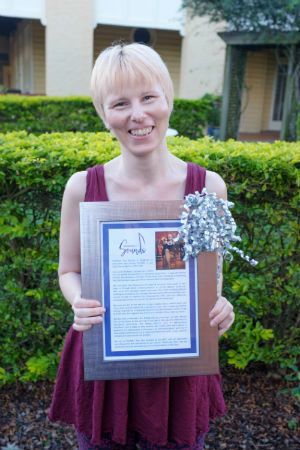 Jess’s photo and testimonial will be displayed in Hobart along with award recipients from other choruses throughout Australia. 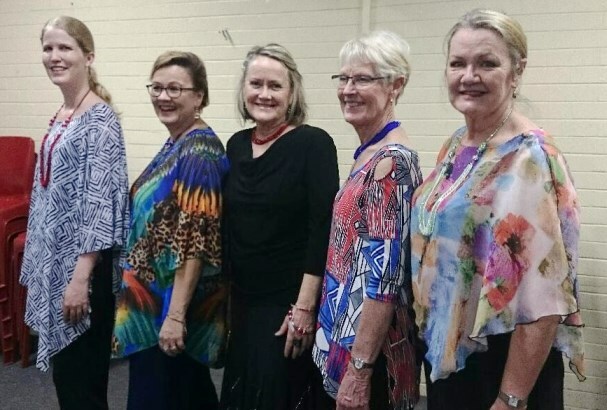 This will be the first Sweet Adelines convention for five of our members who have joined us since our last convention in Wollongong in 2016. Courtney, Edit, Olivia, Suzi and Anne – we wish you all a joyous convention experience! Our recent preparations will stand us in good stead for our first “dress rehearsal” performance at the Barbershop Harmony Australia Sunshine Region Convention on Saturday 28 April. 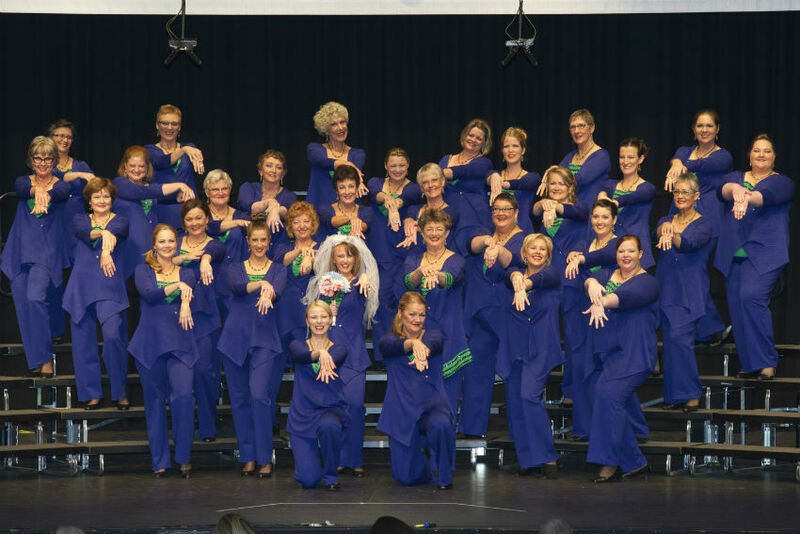 This is the regional competition of the local men’s barbershop organisation; however, women’s choruses are able to compete in the invitational category. This will give us valuable large-venue experience ahead of the Hobart convention. If you would like to see BCS performing at our best, please join us for our Family and Friends Concert on Thursday 10 May at 8:30pm at Lavalla Centre, 58 Fernberg Road, Paddington. We will present our convention package in full costume, and you are invited to join us for light refreshment afterwards. No need to book – just turn up for this free event. Enjoying a delicious feed by Pizzantica after our hard work at retreat. Feature image: Sweet Adeline of the Year 2018 - Jess Harriden. Sing with Brisbane City Sounds in 2018! Have you always dreamed of singing in an accomplished vocal group? Have you wanted to, but felt you weren't good enough? Would you like a chance to learn about a cappella and barbershop while learning some vocal techniques along the way? If you’ve answered ‘yes’ to these questions, we’d love to see you at our 2018 Vocal Education Program! The program will run for four Thursday nights from 8 February until 1 March at the Lavalla Centre in Paddington. 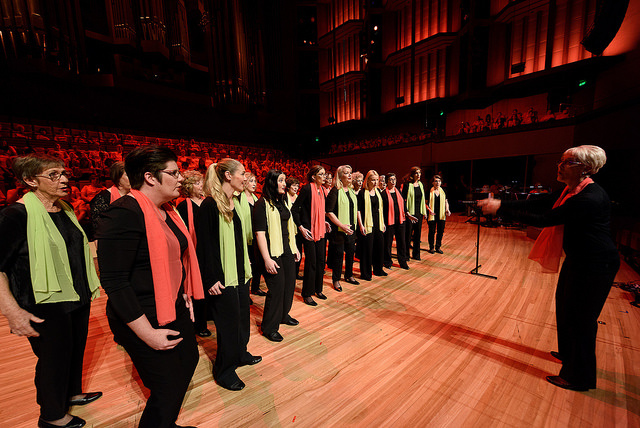 Participants will receive group vocal tuition, learn music with the chorus, and have the opportunity to perform with Brisbane City Sounds at our Vocal Program Finale Event on 4 March. 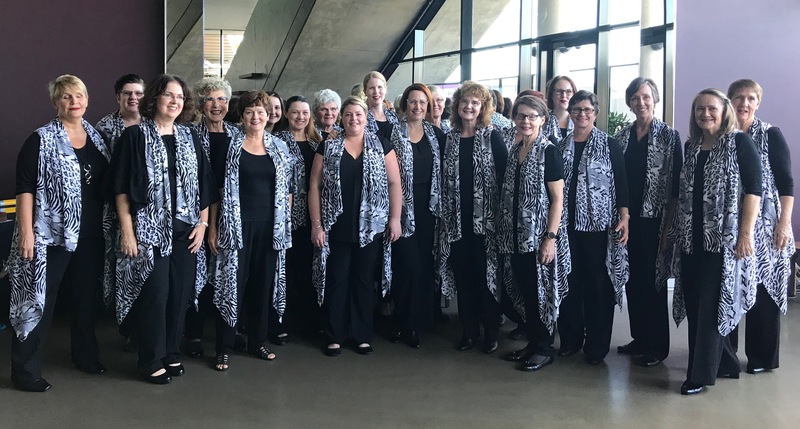 ‘As a 25+ year vocal music teacher, I'm so excited to be leading this group of women and to share with them the joy of singing and the excitement and genuine emotions that music can create!’ says Musical Director, Kelly Shepard. Our annual auditions will follow the Vocal Education Program, but the program is designed as a stand-alone series of workshops, and there is no obligation to join our chorus. We welcome anyone to come along for four weeks, learn a bit about our style of singing, and have some fun! Registration is $100, which includes learning materials, group vocal tuition and entry to the Finale Event. Sign up now via: www.trybooking.com/SMDS. 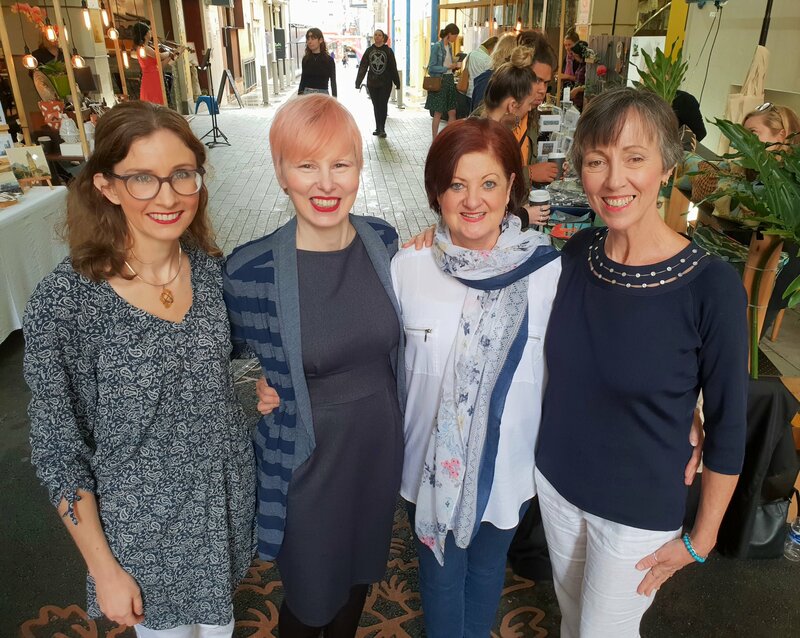 Make 2018 the year that you do something for yourself – something you love, which connects you to like-minded women and brings you joy! For more information about the program, please contact us via: info@brisbanecitysounds.com.au. Kelly has recently completed a trial period with the chorus, which included preparing us for our annual Christmas concert, An A Cappella Christmas, on Friday 8 December. Kelly has sung professionally for 25 years, and is well known to many in the barbershop world. He has recently relocated with his family to Australia from the USA, where he performed with the award-winning Barbershop Harmony Society chorus, Masters of Harmony, as well as five-time international bronze medallist quartet, Metropolis. Kelly previously directed Pacific Sound Chorus in California, a cappella group Kol Echad, and the Los Angeles chapter of HaZamir (an international Jewish youth choir). An A Cappella Christmas followed on from carolling last weekend (at the Christmas in the Creek event at Albany Creek, and at the Stones Corner Twilight Markets), and showcased our Christmas repertoire, our small groups and quartets, a very entertaining ukulele trio, and even a couple of mischievous elves! If you missed it you still have a chance to catch us at out and about, at St Gerald Majella Church, Chermside West, at 7.30pm Wednesday 20 December, and at Southbank River Quay Green from 6pm Thursday 21 December. 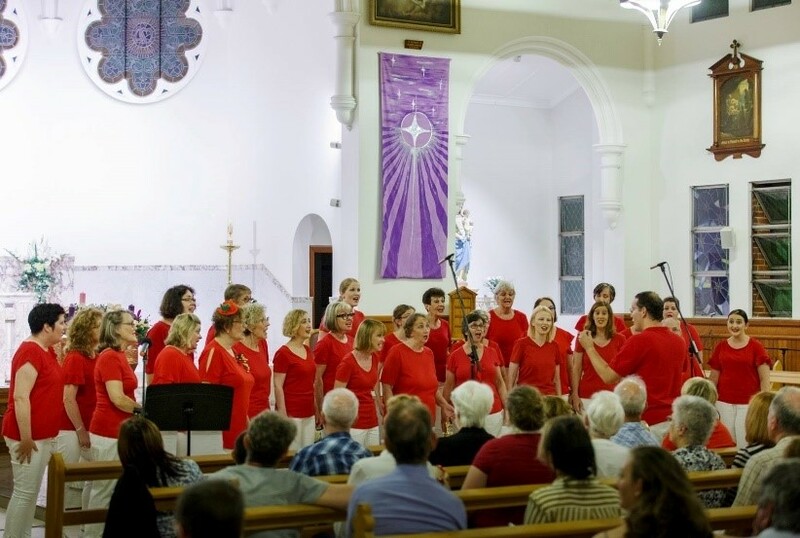 Soon it will be the festive season, and Brisbane City Sounds is looking forward to presenting our annual Christmas concert, ‘An A Cappella Christmas’ on Friday 8th December at 7pm in Sacred Heart Church, Paddington. An A Cappella Christmas will feature all your favourite holiday songs, sung in exquisite four-part harmony by our award-winning choir. Quartets and small groups will also feature, and we love it when everyone in the audience sings along! Brisbane City Sounds is supporting Communify’s ‘The Pantry’ – a program that provides food to local people who are struggling financially. We encourage audience members to bring along non-perishable food items to An A Cappella Christmas, which we will collect and donate to The Pantry. As a thank-you from Brisbane City Sounds, every donor will receive a voucher for a free item from our supper selection! Additional sweet treats and coffee will also be available for purchase at intermission. 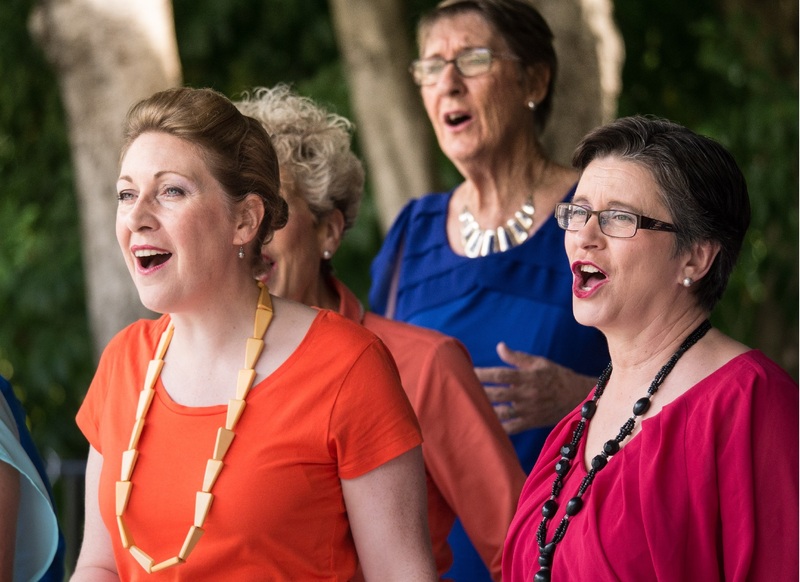 Brisbane City Sounds will be hosting an afternoon workshop on 12 November for all women who love to sing! Singers with any level of experience are welcome to this event, where we will introduce you to a cappella music, harmonising, and the barbershop artform. At the Sing! A Cappella Harmony Workshop, participants will learn ways to improve breath support, add resonance to their sound, blend better with other singers, and much more. 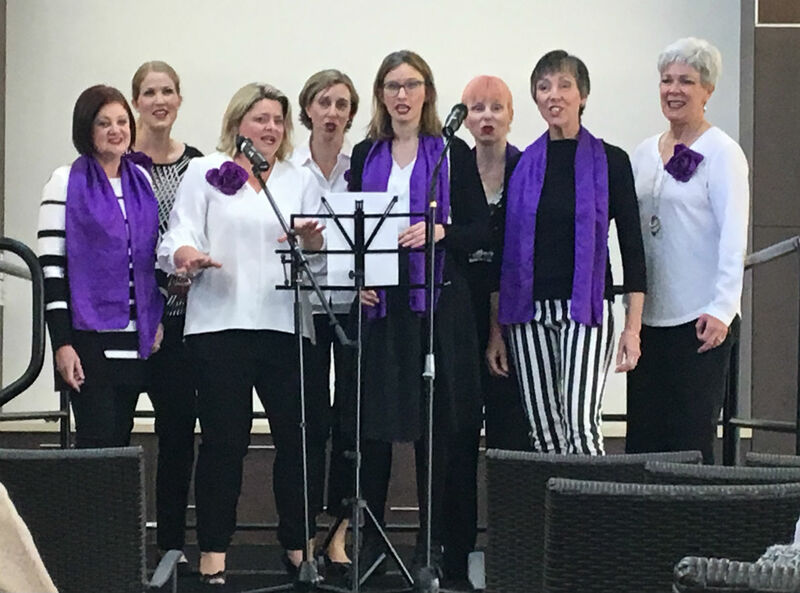 Whether you’re a complete novice, or an accomplished singer who has been missing group singing, we’d love to meet you on 12th November from midday to 4pm at the Lavalla Centre, 58 Fernberg Rd, Paddington. The registration fee is only $20, which includes group vocal tuition and afternoon tea. Register now, or contact us for more information. 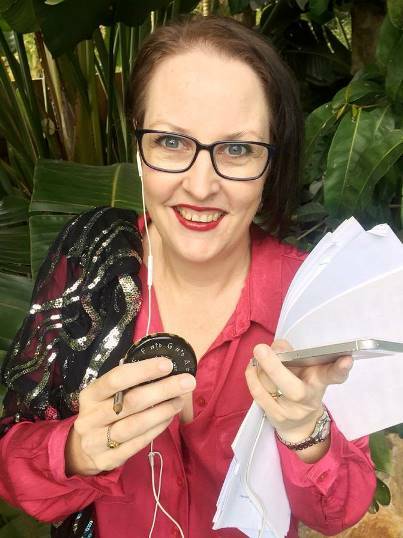 Following our first performance in Brisbane Sings!, Brisbane City Sounds has continued our collaboration with Donna Dyson, 2016 ASA-APRA Songwriter of the Year (title shared with Damien Leith). On 14 October at 8:30pm, Donna will be presenting “Songs from the Vault”, which will showcase some of the remarkable songs from her extensive catalogue. BCS feels privileged to be performing two beautiful works in the concert – one alongside ARIA award-winning musician Tyrone Noonan. Other soloists and choirs performing in the show include Damien Leith, David Willersdorf, Hillbrook Chorale, Vox, Queensland Show Choir, Kat Bryant, Fran Morris, Tony Dee, Bek Hull, Sophie Banister, and surprise international guests! A highlight of this concert is that audience members will be given a rare insight into the stories behind each of the songs performed. “This concert is about my music and those I compose for,” says Donna. “I’m so honoured to open the song vault for one night only and raise funds for MS”. Join us for this special event at Bille Brown Studio, 78 Montague Rd South Brisbane. composed by Donna Dyson and Tyrone Noonan. Photo credit: Queensland Show Choir. Brisbane City Sounds was proud to take to the QPAC Concert Hall stage on 6 August 2017, as part of Brisbane Sings! 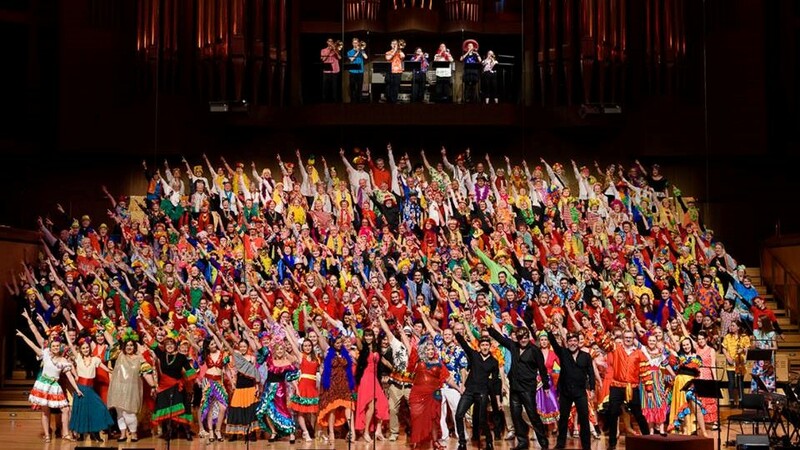 This event brought together choirs from all over Brisbane and surrounds, forming a 500-strong massed choir. As part of the massed choir, we had fun presenting a varied repertoire from artists such as Billy Joel and Ricky Martin. Soloist David Kidd performs with BCS. 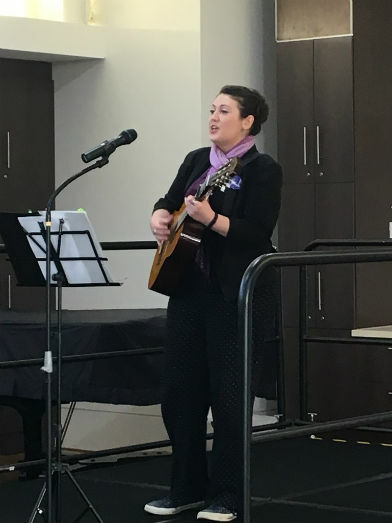 In addition to the massed choir performance, we were excited to premiere a new song by singer-songwriter Tyrone Noonan and 2016 APRA ASA Australian Songwriter of the Year, Donna Dyson. We performed “Music is for All” alongside soloist David Kidd, past member of the Ten Tenors and current member of Tenori. BCS was also chosen to present a song from our own repertoire, “Warrior”, which is a moving piece reflecting the strength we have as women. We would like to thank guest director Jill Harris for working with us on this piece and leading us on stage. It was an honour to work with the inspiring Donna Dyson on this project, and we look forward to the opportunities that our new friendship with Donna may bring. Watch this space! 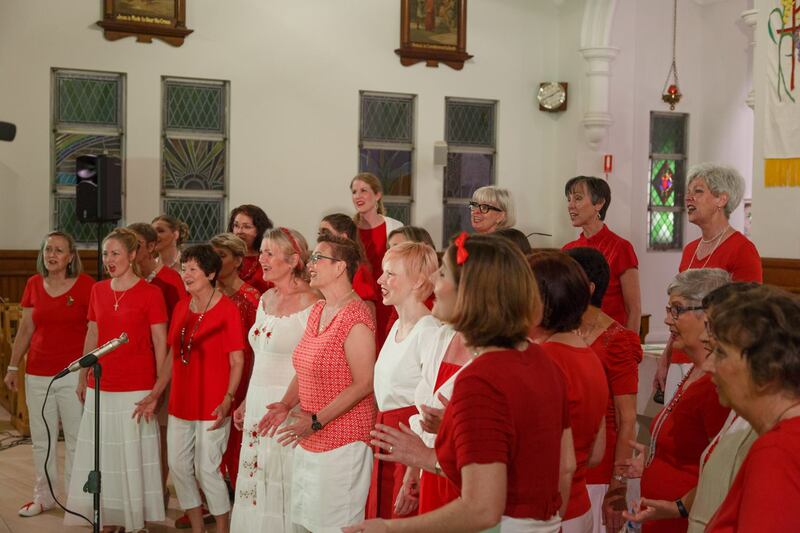 See more photos of Brisbane Sings! 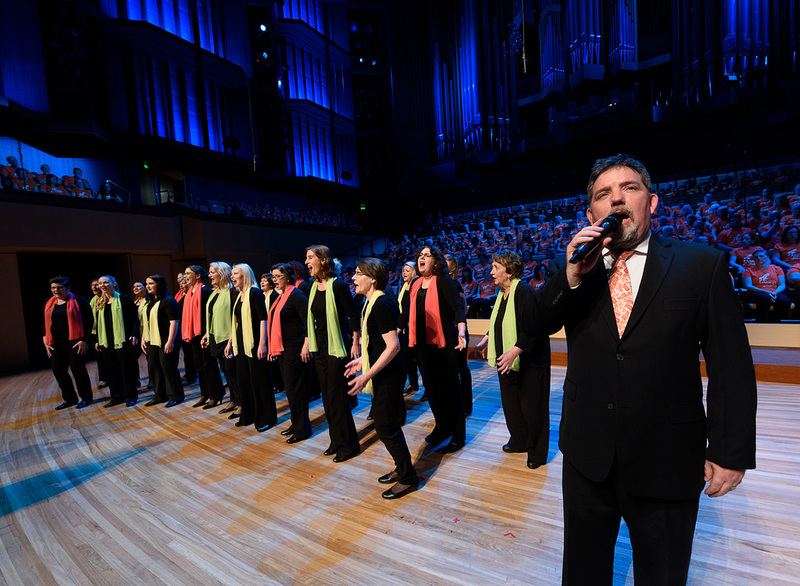 Brisbane City Sounds Chorus will take to the QPAC Concert Hall stage on Sunday 6 August, having proudly been chosen to perform an original song with David Kidd – past member of the Ten Tenors, and current member of Tenori. 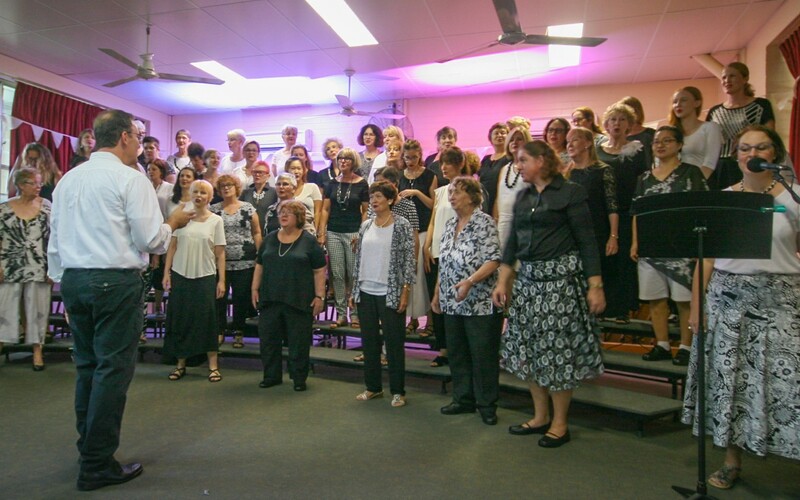 BCS will also has the honour of performing one of our own songs, as well as the opportunity of joining other Brisbane groups to form a combined choir of 500 voices as part of Brisbane Sings! 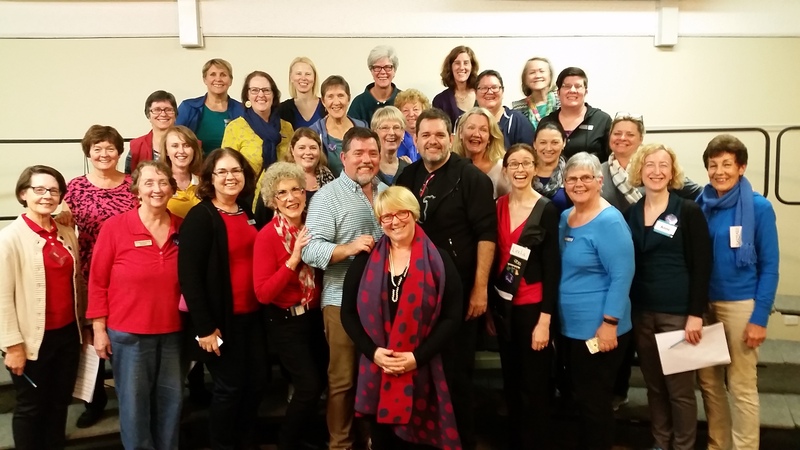 BCS was selected to perform with David Kidd after Donna Dyson, 2016 APRA ASA Australian Songwriter of the Year, attended one of the chorus’s weekly rehearsals. BCS members are very excited about this amazing opportunity! Tickets for Brisbane Sings! are now available at QPAC. 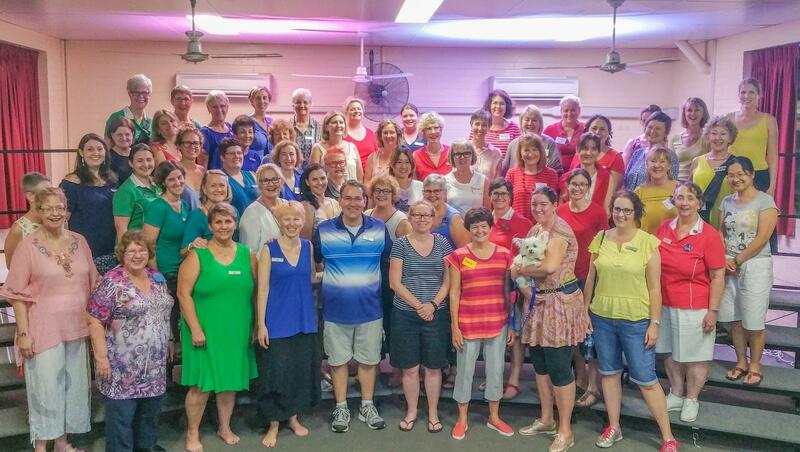 Photo: BCS was joined at rehearsal by three members of the Brisbane Sings! team: Musical Director Craig Allister Young (centre right), Producer and Soloist David Kidd (centre left), and Composer in Residence Donna Dyson (centre). These new members first joined us via our annual Vocal Education Program, after which they passed an audition and became prospective members. They then completed a 3-month onboarding period, during which they learnt several new songs and gained an understanding of chorus expectations . BCS have been running an onboarding program for several years now, and have found that this period of time before full membership is beneficial for our new singers to find out if BCS is the choir for them. During the onboarding period, new singers attend vocal production classes during rehearsal, and are offered individual instruction on vocal technique and physical movement / showmanship skills. It’s also an opportunity for our onboarders to get to know us and experience the culture of BCS before completely committing to membership. 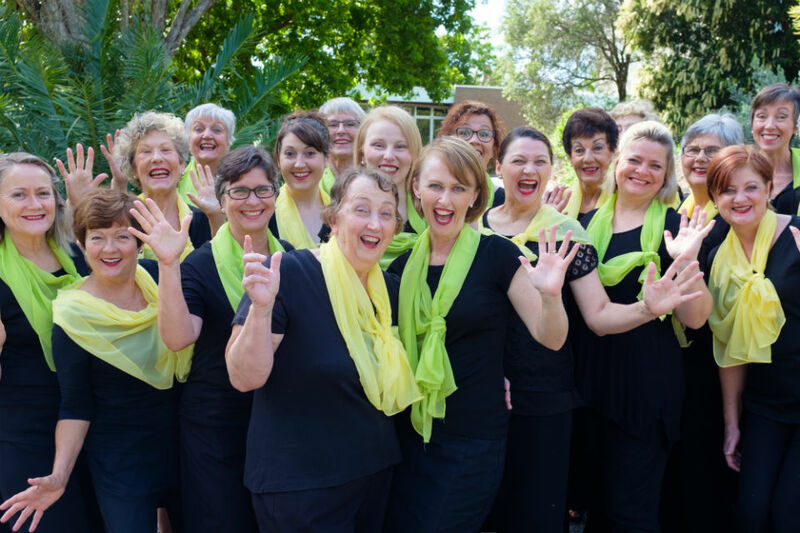 Our new members have recently had the opportunity to sing with BCS at “Christmas in July” at the Rose Café, Bayside Uniting Church Manly, where we performed some much-loved Christmas carols as well as other repertoire. 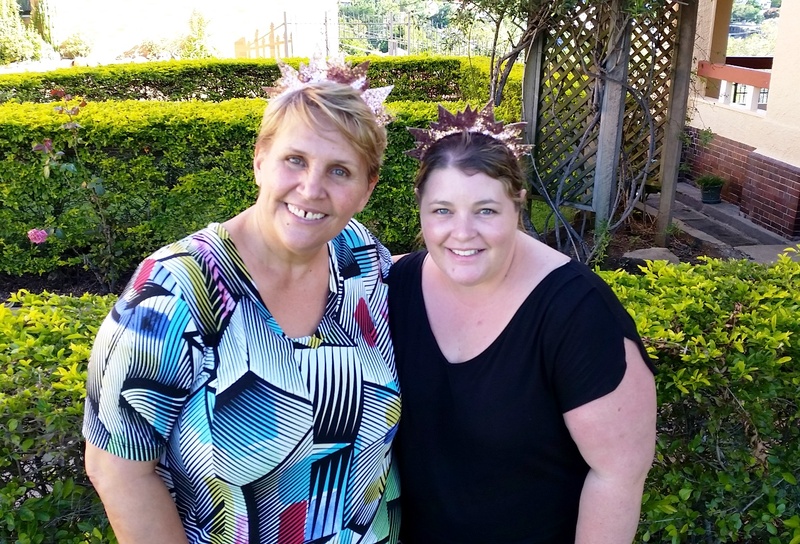 Rose Café is an initiative for women run by volunteers from the church; it is a similar concept to the Men’s Shed movement, providing a place for women to meet and engage with other women. BCS were honored to be invited to sing, and had a lovely time entertaining the crowd. Another introduction to BCS culture for our new members was taking part in the running of a sausage sizzle at Bunnings Stafford. 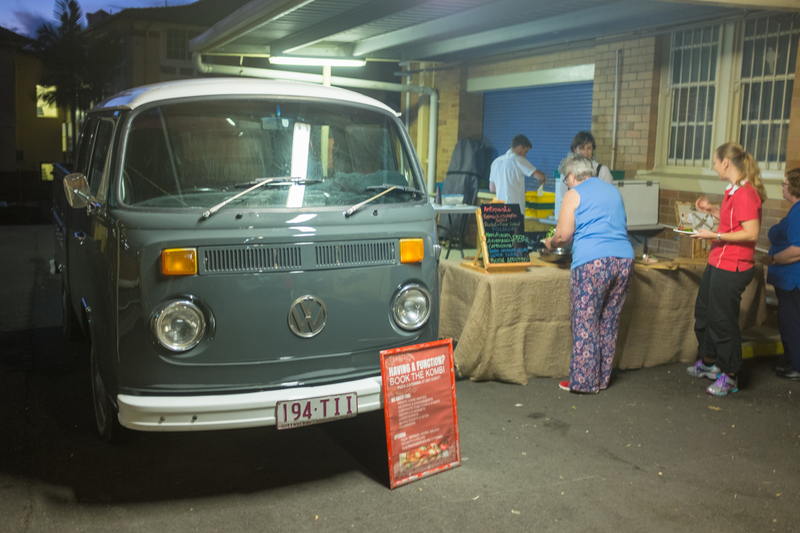 There is stiff competition for sausage sizzle dates at this busy store, so we were very lucky to secure a fundraiser at the end of the school holidays. 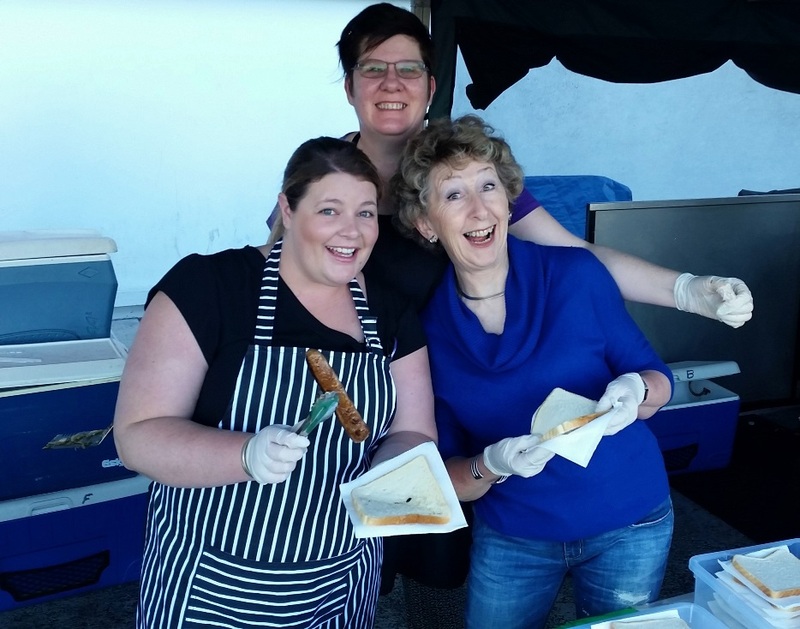 Thanks to the efforts of our members and their families, this sausage sizzle was both a great revenue raiser and a fun event! Brisbane City Sounds has more exciting performances in the near future. Keep an eye of the website and our Facebook page for further information coming soon! 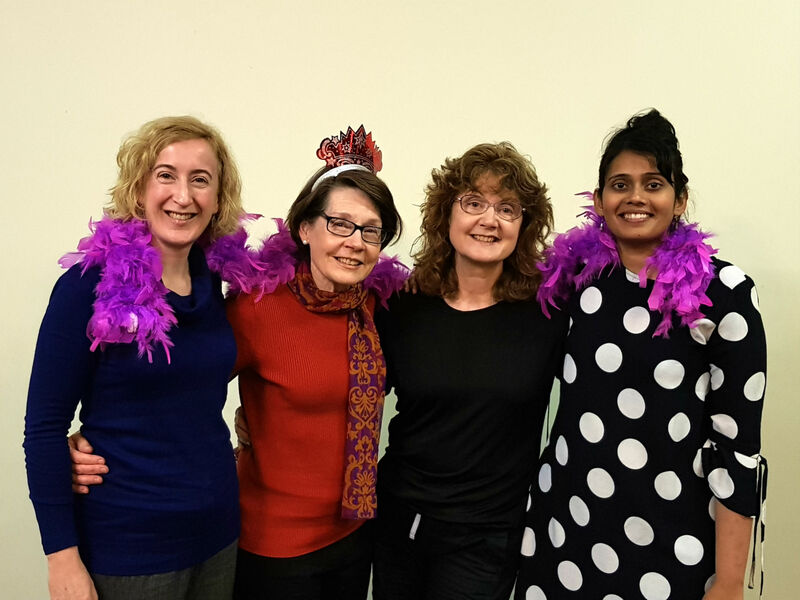 Featured photo: New members Anne, Helen, Sheila and Krutika. 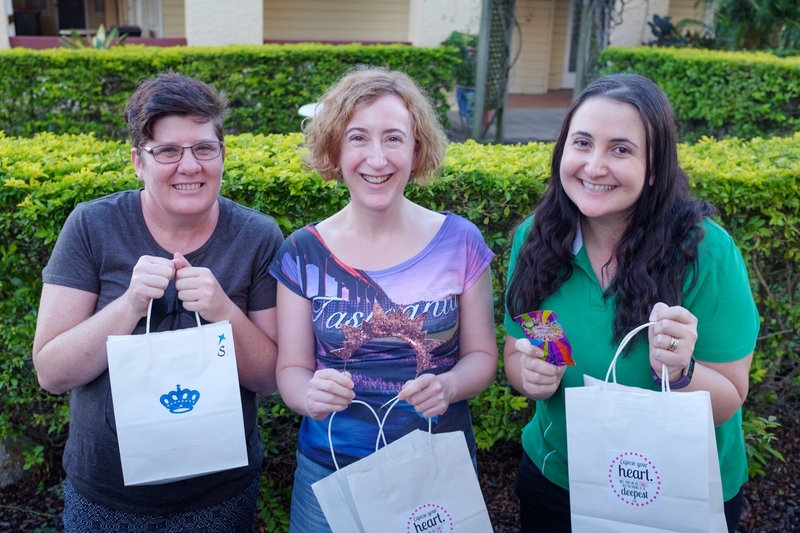 Brisbane City Sounds recently enjoyed a wonderful afternoon of song and movie entertainment at Palace Barracks Cinema. BCS performed a short repertoire for the assembled crowd before joining them to watch “The Zookeeper’s Wife” on its opening weekend. The occasion also marked the first official performance of some of our newest singers. Helen, Janeen, Krutika, Courtney, Cass, Bernadette, Anne and Sheila initially joined us for our vocal education program back in February and enjoyed themselves so much that they wanted to stay. Following successful auditions, these eight new singers continue on their journey towards full membership by means of an “onboarding” period, designed to help them get a feel for what being part of our choir really means. The fresh enthusiasm and talent brought by new members is always very welcome and we look forward to performing more beautiful songs with them in the coming months. BCS hosts movie events like this a few times per year, and it is always a lovely way to spend a Sunday afternoon. Keep an eye on the website or follow our Facebook page to find out details of our next events! BCS presented this concert on Saturday 25 February, as a finale to our annual Vocal Education Program. During the afternoon, BCS and special guests Sparkling Blends Quartet entertained the audience with several of our favourite songs. We also welcomed more than 20 participants from our Vocal Education Program to the stage, before capping off the event with afternoon tea. 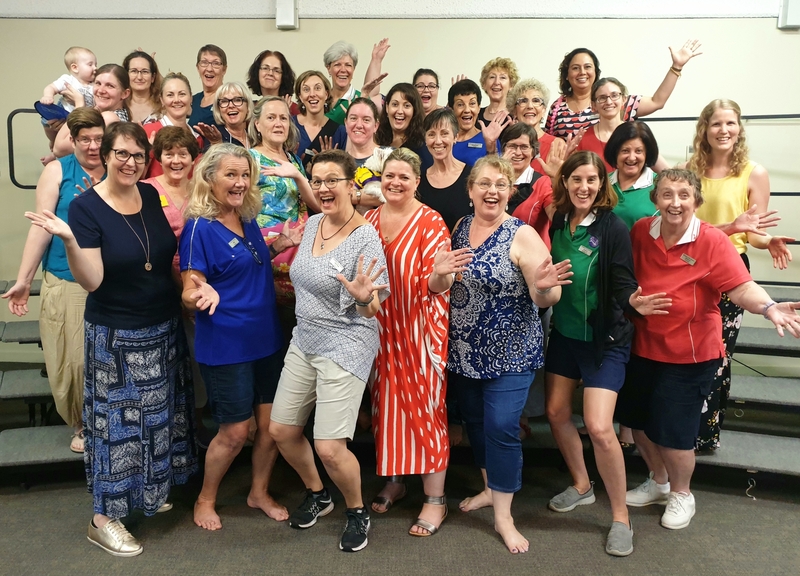 The members of Brisbane City Sounds always enjoy the Vocal Education Program, as we are able to meet like-minded women from the wider community and introduce them to barbershop harmony. Around one-third of the 2017 program participants are now planning to audition, and we look forward to welcoming them into our choir family more permanently. 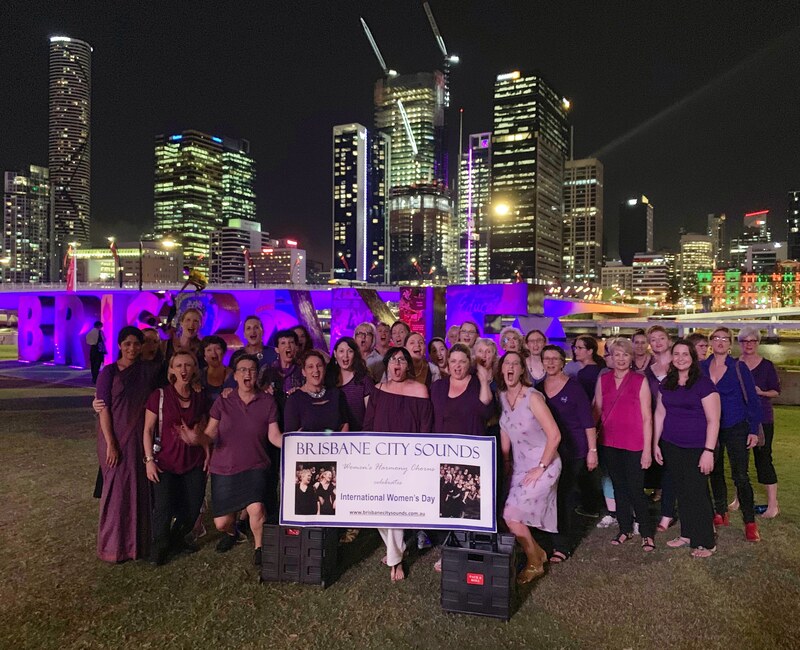 Following this year’s successful Vocal Education Program and Showcase Concert, Brisbane City Sounds would like to make special mention of our music team. 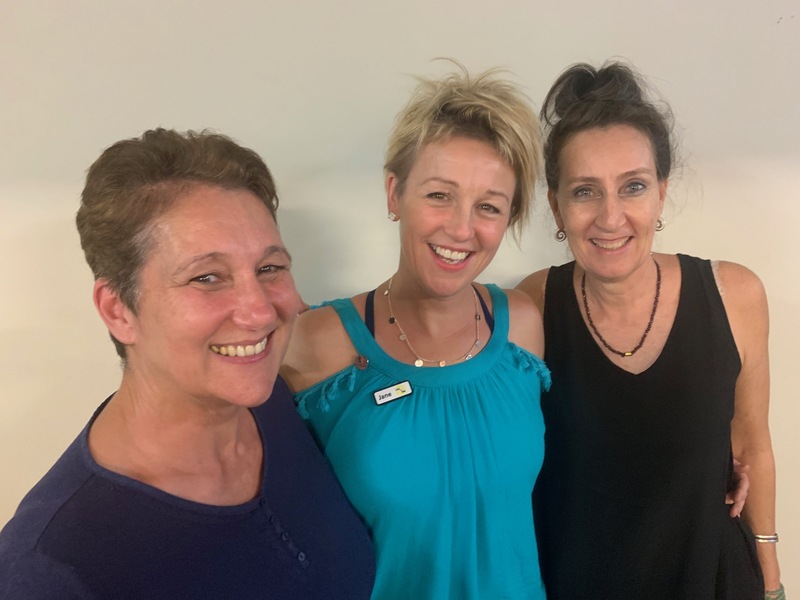 These talented women have led us at rehearsals over the past few months, and acted as interim directors at our Showcase Concert. We are proud to have so many members with such strong musical knowledge and leadership skill, as well as the willingness to contribute their time. We look forward to what the future of Brisbane City Sounds holds! Featured photo: BCS joined by our Vocal Education Program Participants, directed by Guest Musical Director Jacqueline. Join Brisbane City Sounds and some special guests at our 2017 Showcase Concert – a short program of music, followed by afternoon tea. 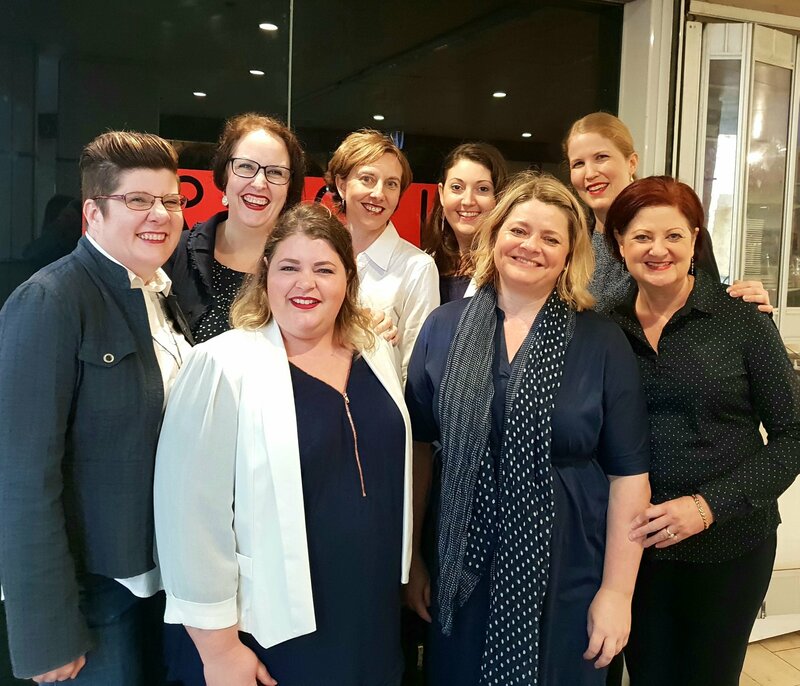 Throughout February we have welcomed more than 30 women to our annual Vocal Education Program, where they have worked on their vocal production skills and learnt two a cappella pieces. Come along to hear the results of their efforts, and also enjoy performances by Brisbane City Sounds and Sparkling Blends quartet. Brisbane City Sounds is running a vocal education program in February 2017 to introduce new singers to singing a cappella, barbershop style. 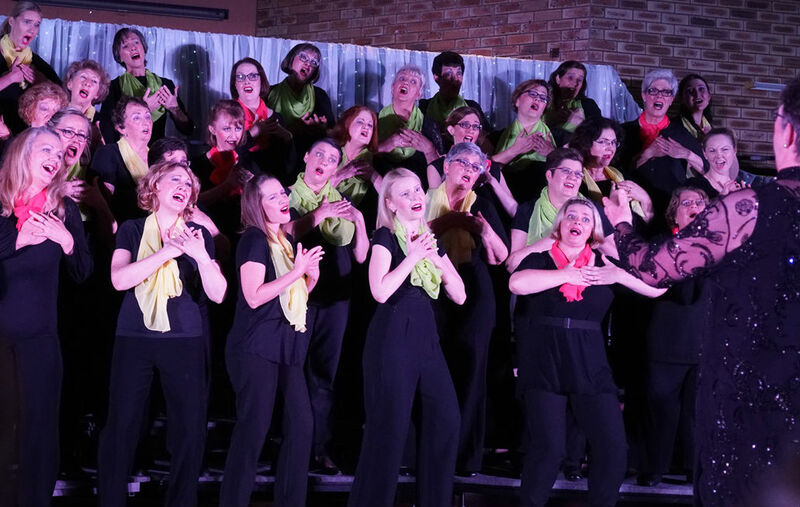 Interested women can come and join us over four rehearsal nights, learn two songs with us, then have the chance to perform with the chorus at our Vocal Program Showcase, planned for Saturday 25 February. We welcome women of all levels of singing experience, and can place you in a voice part to suit your vocal range. This is a great way to see how we operate, do something different, learn something and have fun! A non-refundable $60 covers the program’s tuition, and music copyright fees. We will be holding auditions for the chorus after completion of the program, which will then run into an onboarding program to provide further education and support. This will be the only new member intake for 2017, so book your ticket now! 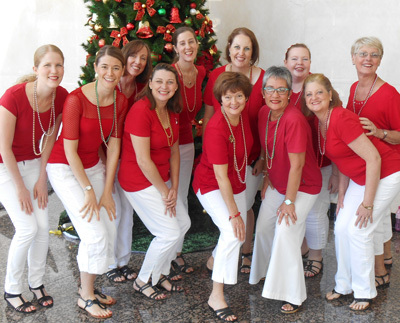 On 9 December, Brisbane City Sounds was proud to host our own Christmas concert, 'An A Cappella Christmas'. 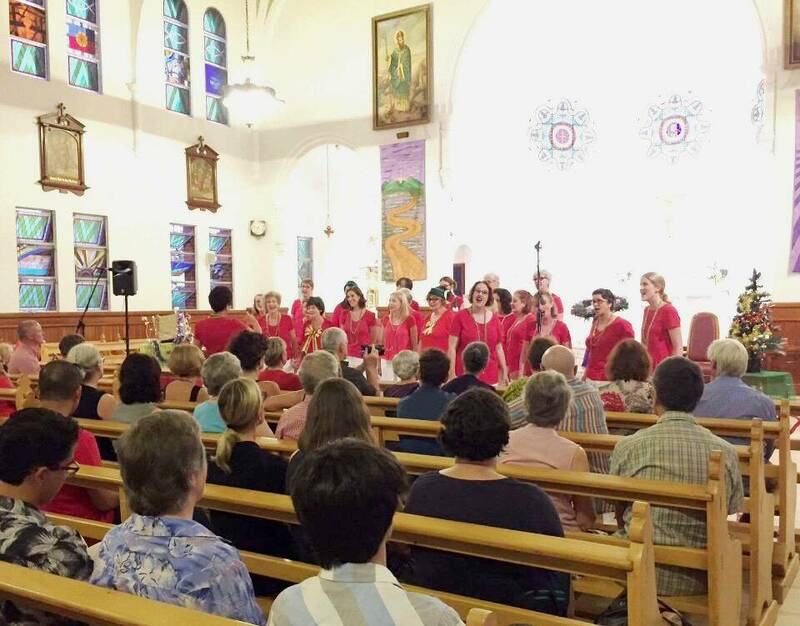 The show was presented in the beautiful Sacred Heart Church in Paddington, and featured the chorus, several of our quartets and special guests The River City Clippers. A selection of Santa’s most mischievous elves also made an appearance! If you missed your chance to hear our carols, you still have one more chance. 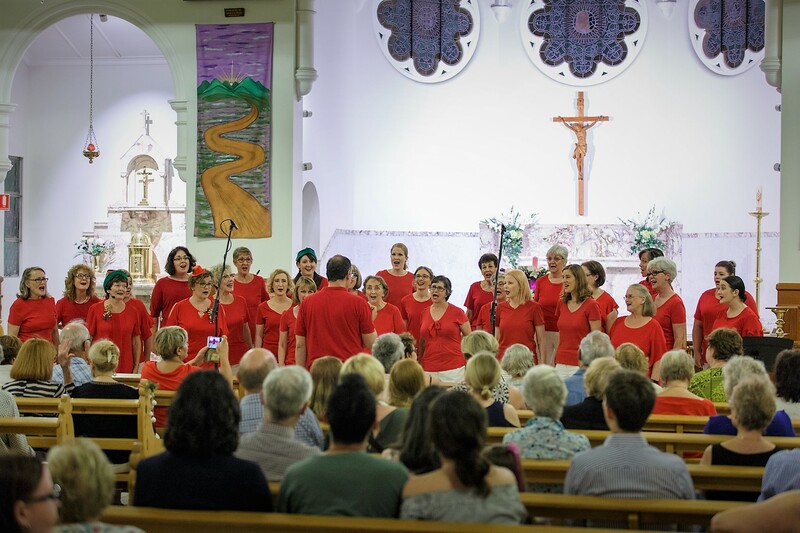 Brisbane City Sounds will be performing at St Gerard Majella Church in Chermside West on Wednesday 21 December from 7.30pm. We'd like to take this opportunity to thank all our families and friends who have supported us throughout the year. We are always extremely grateful for helping us at events, coming to our shows, and supporting us in all our endeavours. Brisbane City Sounds were pleased to present our annual Portofino fashion parade on 12 November. Our guests enjoyed great company, a lavish afternoon tea, some top modelling and a few songs performed by the chorus. Following the fashion parade there was a shopping opportunity, and most of us took home a bargain or two! Thanks to all our friends and family who came along to spend an afternoon with us, and to the organising committee for putting together such a fun event. On 22 October, Brisbane City Sounds presented ‘Sauce on the Side: Reminiscing’. 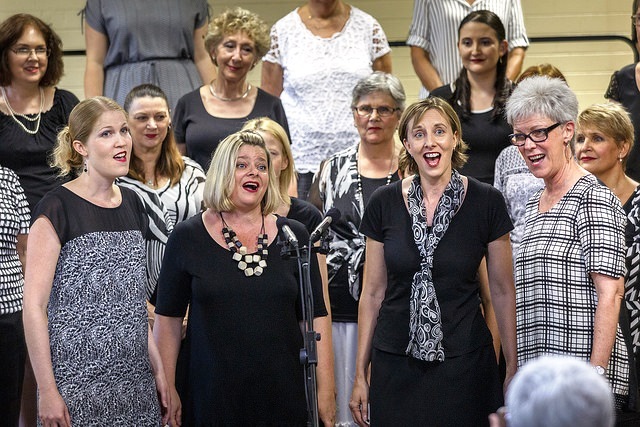 This show featured small groups, soloists, dancers and our full chorus of 35 women, and showcased some of our favourite songs from the past few years, including musical theatre hits, pop songs, ballads and Australian classics. This was a special show for Brisbane City Sounds as it was our last performance with Musical Director Rose McGee. 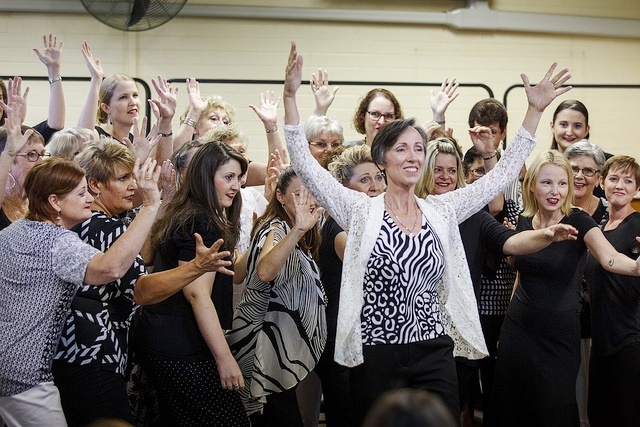 Rose has retired after an impressive 24 years of directing many choruses around Australia. In 2011, Rose took over as Musical Director for Brisbane City Sounds, and we haven’t looked back. Over that time we have gone from strength to strength, improving under her direction and winning awards at the national women’s barbershop convention. Rose has left an incredible legacy with BCS, and we wish her every happiness in her new adventures. See more photos of our show! If you missed our show, you still have several other opportunities to see us before Christmas! If this leaves you wanting more, we will also be presenting ‘An A Cappella Christmas’, from 6.30pm on Friday 9 December, at Sacred Heart Church, Paddington. Come and hear you favourite Christmas carols sung a cappella by Brisbane City Sounds, our quartets, and special guests The River City Clippers. Tickets available now! We are also planning a vocal education program early in 2017, keep your eye out for further details soon. If you are interested in becoming a member of our chorus, this will be the only opportunity to audition in 2017. Contact us to find out more!